Will AirPods Work with Apple TV and tvOS? Apple’s highly anticipated wireless AirPods are set to launch soon, with a purchase date most likely to be revealed at the company’s “hello again” Mac event on October 27. What makes AirPods so ‘magical’ is the ease of pairing, thanks to Apple’s W1 chip, also found in a trio of new offerings in Beats headphones. 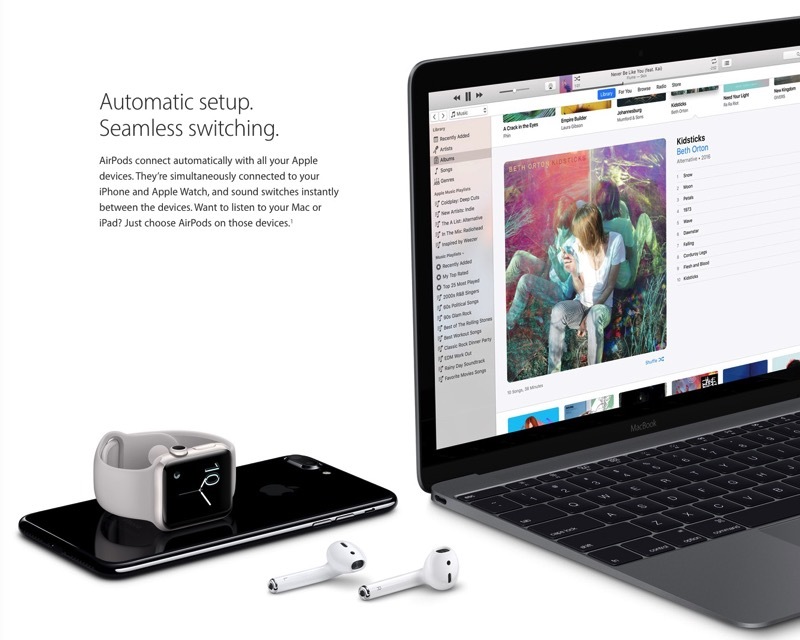 AirPods are tied to iCloud (macOS Sierra, iOS 10, watchOS 3), and Apple says they are connected simultaneously with your iPhone and Apple Watch, switching sound automatically. As for using AirPods on your Mac or iPad, Apple says you “just choose AirPods on those devices.” No pairing is needed. What’s missing? Apple TV and tvOS. Will AirPods work with your Apple TV? The answer is yes, but just like regular Bluetooth headphones, for now. iMore’s Rene Ritchie shared his thoughts on AirPods, saying on Twitter “Apple TV is a multi-person device, so the iCloud pairing model isn’t clear,” after noting the headphones are able to connect to an Apple TV like any standard Bluetooth device. Since tvOS on Apple TV 4 allows multiple iCloud accounts to be setup, for now, it seems it would be tricky for AirPods to switch over to the proper account. While AirPods come in priced at $219 CAD, the ease of pairing and automatic switching between iCloud devices are the selling factors, while having 24 battery life thanks to its quick-charging battery case. It will be interesting to see if Apple adds updates to tvOS to allow for seamless iCloud account switching when it detects active in-ear AirPods. Then, AirPods would be the ultimate wireless headphones, allowing users to seamlessly transition between all iCloud devices.